Hello everyone! 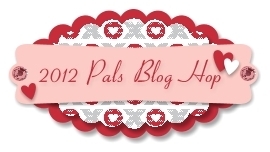 Welcome to the January Pals Blog Hop-- "Love is in the Air." 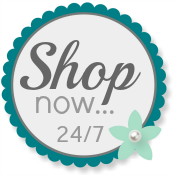 You've likely hopped over from Leah's Stampin' Corner and I'm stop #23 on this month's hop. I made today's card for my husband. He will be traveling on business just before Valentine's Day and I'm going to sneak this into his suitcase. When he gets back just before Valentine's Day, we'll be ready to celebrate! I began with a Basic Black card base. Then I layered on Real Red card stock that I trimmed using the Scallop Trim Border punch. The next layer is a piece of First Edition Designer Series Paper. I then ran Sticky Strip across the width of the DSP and "ruffled" a 1" strip of Gold Waffle paper across it. I used another Sticky Strip to attach the 1-1/4" Black Stripe ribbon with the top edge just above the bottom edge of the Gold Waffle Paper. I used the Scalloped Heart of Hearts to cut out a Basic Black heart. Next, I used the Heart Punch to cut out a Real Red heart from a piece of card stock that had been run through the Big Shot with the Elegant Lines Embossing Folder. I used Gold Shimmer Paint and a sponge dauber to "paint" the raised portions of the heart. I put some Basic Pearls onto the circles in the embossing and used more Gold Shimmer Paint to shine the pearls a bit. I adhered the heart to the left side of the ribbon. For the sentiment, I used P. S. I Love You stamp set from the new Occasions Mini and again I colored directly onto the stamp with my Basic Black and Real Red Stampin' Write markers. I made a banner out of the Very Vanilla card stock and curled it with my stylus (left edge) and Bone Folder (right edge), added a Red Glimmer Brad and then adhered it with Stampin' Dimensionals. Here is a closeup of the envelope. I put this cute stamp right where you would see the postal cancellation mark if it were mailed. I used Stampin' Write markers to color the stamp in Real Red and Basic Black. Thank you for looking! I hope you enjoy the 30+ members of the Pals for ideas on how to show some lovin' to friends and family this Valentine's Day! Your next stop is #24, Diane Roberts at Score at Four and a Quarter. For viewing the blogs in any order you like, here is complete listing! Thanks for hopping with us! See you next time. I love comments, so won't you please leave one below? Maxine Conrad at Stamp to the MAX! Frenchiee Hum at Frenchiee's Spot. Amanda Cramer at Mrs. C with Style! Julie Trevett-Smith at The Stampin' Affair! Your color choices are my favorite! Very pretty! Sweet card, Patti! I love First Edition DSP and think it goes well for Valentine's Day. I know your husband will appreciate the thought! So many wonderful details. I am sure your husband will appreciate your creativity and thoughtfulness. TFS! Very pretty card, and such a great idea to sneak it into your hubbys bag. He will love it. TFS! Love is in the air and I am lovin' this! This is wonderful - love that waffle paper too! Wonderful card, Patti! So many fabulous details! What a sweet idea! Patti. Love this! This is one of my favorites of your cards ever! Love everything about it! Hugs. Great modern combo. A bit avant garde. Fantastic. Beautiful card! I love how you placed the pearls on the heart! LOVE the black and white with red and the touch of gold, Patti! The gold waffle paper is really eye-catching! And, the B&W striped ribbon looks great against the newsprint DSP! Love how you used the waffle paper! Great Card! Glitter brads going on my wish list now! Your card is beautiful! Thank you for participating in the blog hop. Such a great Valentine's card for your husband!!! Perfect balance for a masculine card but with nice details!! Love the use of waffle paper! Dad will love this! You are so awesome!